Flat out the most spectacular thing on the Antrim coast is the Giant's Causeway. 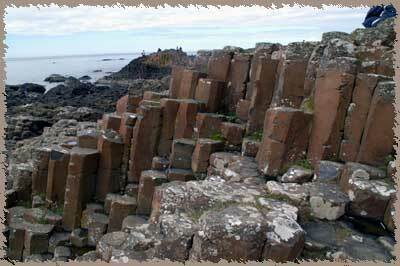 The bizarre basalt stone columns stretch out into the sea (and the other end is in Scotland). 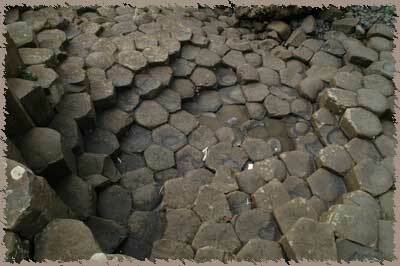 The legend is that the causeway was a bridge built by giants. Fionn mac Cumhaill (macCool) fell in love with a giantess from the island of Staffa and built this huge highway to travel to her side. That's only one versin of the legend -- another is that he built the causeway to fight the giants in Scotland, but when he arrived, the Scottish giant was so fearsome that he ran home and was hidden by his wife. SHe put him in a huge oversized bed, and when the giant saw the "baby", he was afraid and fled back to Scotland. 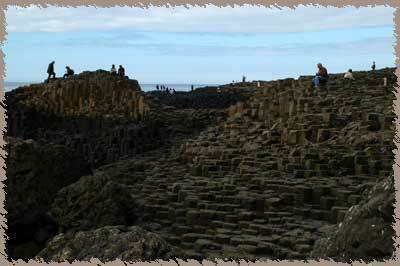 In either case, the causeway has been a tourist attraction since around 1700. There are roughtly 37,000 polygonal blocks (most are hexagons, but some have 5 or as many as 10 sides) pushed up and arranged in ranks. I thought they looked much like the results of those weird pinboard tows -- you know, the kind wher eyou press you fingers against the back of the board and the pins rise up and make an outline of your hand? It's absolutely fascinating, and I half-expected them to move when I stepped on them. The stones are the result of a explosing some 60 million years ago, when an underground eruption pushed molten basalt to the surface, where it cooled into these weird, crystalline shapes Walking along the well-marked path, you can see the many formations that have been given names: the Camel, Organ Pipes, etc. The little guide-booklet from the tourist center is very helpful.